Yesterday, President Trump decided to visit the family of late President George H.W. Bush, who were staying at the presidential guest house known as Blair House. Blair House, which was constructed in 1824, is oftentimes referred to as the “world’s most exclusive hotel” because of the famous dignitaries who have stayed there. 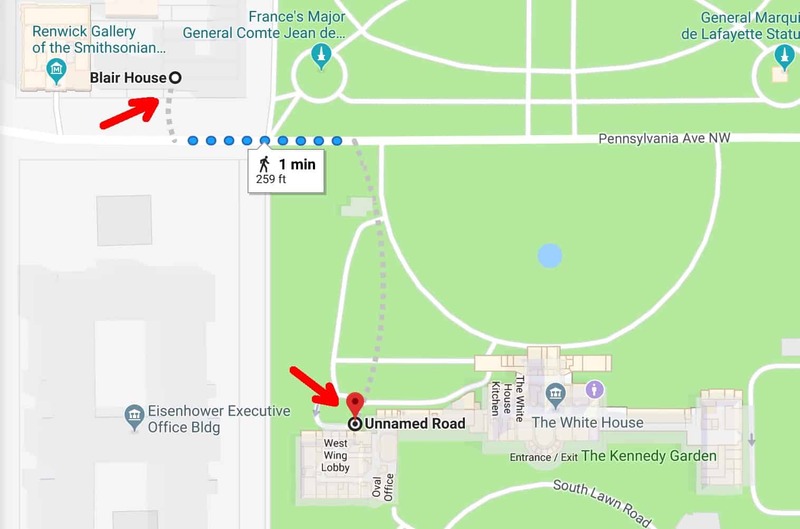 It is located at 1651 Pennsylvania Ave., which is almost directly across the street from the White House, just a 1-2 minute walk from the exit of the West Wing Lobby. This is why it is so surprising that President Trump still required a motorcade in order to make the approximately 225 yard trek from the West Wing to the Bush Family. Jennifer Jacobs, a White House reporter for Bloomberg, first reported the almost humorous requirements needed to get Mr. Trump from point A to point B, in a tweet she made yesterday afternoon. While this isn’t surprising in the least, especially considering the fact that President Trump believes that exercising too much drains the body’s ‘finite’ energy, it is worth noting that President Barack Obama once walked over 2 miles from the White House to the US Department of Interior, stopping along the way to chitchat with American citizens (seen below).